Here’s a slice of the unvarnished truth: I kind of hate whiskey press releases. By and large, they’re even worse than beer press releases; less designed to give you information and more designed to implant a specific perception of the product. You have to pore over a whiskey press release, and even when you do, you won’t necessarily be able to determine exactly what the verbiage means. 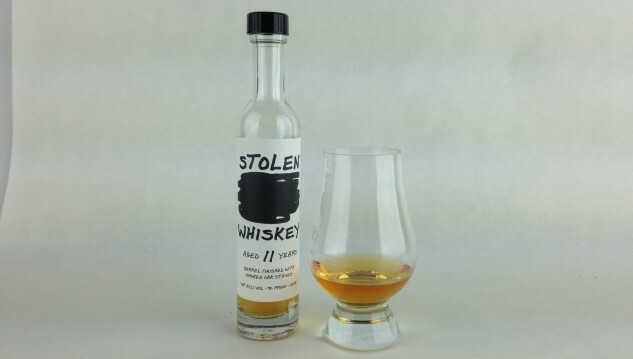 Case in point: When I looked at the press release for Stolen Whiskey, I really wasn’t sure exactly what the product was supposed to be. The base is a “very special 11-year aged whiskey,” but what does that mean? If it was bourbon, wouldn’t they have used that word? Is it an American single malt, or something else entirely? What is this secondary process involving smoked oak barrel staves? I can typically get this kind of information from the company as a writer, but it’s worth noting that 99% of the “average consumers” will not. Most of them will never even make it to the company’s website, and those who do will almost certainly stop there. That’s why, in an ideal world, the full information would be available. — An 11-year corn whiskey. Already, we’re in weird territory, considering that I’ve never had a 100% corn whiskey with that much age on it. — That whiskey is aged in USED barrels for 11 years at MGPI in Indiana—again, very unusual. Used barrels, as opposed to newly charred oak, are typically being used for scotch and Irish whiskey across the Atlantic, but they’re almost never used for American whiskey. — This juice then undergoes a secondary process where it’s re-aged on charred barrel-staves that Stolen takes and smokes, which contributes this whiskey’s color. Without this process, I suspect that it would be more scotch-like in appearance. So what we ultimately have here is a corn whiskey that is being aged like a scotch, before being infused with some smokier flavors via additional aging on smoked wood. Suffice to say, I’ve never had anything even close to that description before. So let’s get to it; how does it actually taste? On the nose, this whiskey presents with big notes of sour oak and sort of green woodiness, which fades into richer impressions of toasted marshmallow and vanilla custard. Wood smoke, as from a fireplace or campfire, is present but not overwhelming, for which I was thankful. My palate is sensitive to smoke, and I tend to perceive it more strongly or overwhelmingly than most tasters, so it was a pleasant surprise to see that this one didn’t come out as a big smoke bomb. Also present on the nose: Honey sweetness, a bit of apple fruitiness and a slightly medicinal note that is not unpleasant. All in all, it’s fairly inviting, not too hot, and quite woody. On the palate, that big rush of oak follows through, but it’s balanced by quite a lot of honey and corny sweetness. There’s a grainy, almost doughy note there, as well as the smoke you would be expecting, but as on the nose it’s fairly judicious and well integrated. This is fairly rich, slightly syrupy whiskey, as 100% corn whiskeys sometimes tend to be, but the residual sugar stops before it gets to be cloying. There’s only a touch of alcohol burn, and an accompanying warming in the chest, with minimal lingering spice. Predominant flavors are wood, honey/corn sweetness and smoke—the deeper caramelization and vanillans you’d expect in a well-aged bourbon are less apparent. All in all, this is fairly enjoyable stuff for drinkers who like slightly sweeter whiskeys with a touch of smoke. This isn’t necessarily the kind of whiskey I’m predisposed to personally enjoying, but it exceeded my expectations fairly handily. I’m not sure I would use it for a Manhattan, but its sweetness is probably pretty well suited to an old fashioned, or maybe a particularly weird, ryeless take on the Sazerac. This Auckland, New Zealand-based brand will arrive on American shelves in March. Jim Vorel is a Paste staff writer and whiskey drinker. You can follow him on Twitter.